This post is sponsored in conjunction with #BrunchWeek. I received product samples from sponsor companies to aid in the creation of the #Brunchweek recipes. All opinions are mine alone. 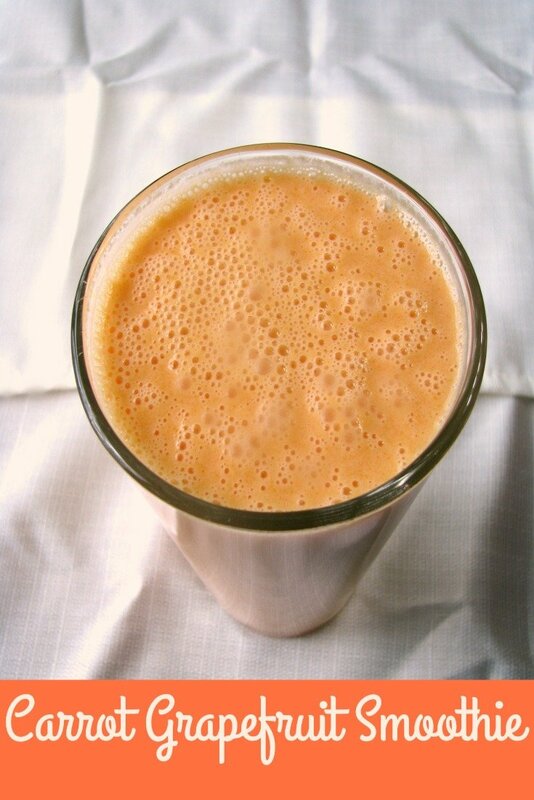 Healthy, tart Carrot Grapefruit Smoothie made with organic cooked carrots, fresh grapefruit, and plain yogurt, is perfect for breakfast, brunch, or a mid-morning pick me up. Welcome to day 2 of #BrunchWeek hosted by Terri from Love and Confections and Christie from A Kitchen Hoor’s Adventures. This year is even bigger and better than ever! Thirty-eight bloggers from around the country are showcasing their best brunch dishes. We have so many delicious recipes for you to enjoy throughout the week (over 150!!) including cocktails, appetizers, pastries, tarts, main courses, and plenty of desserts! Our BrunchWeek Sponsors are helping us give away some great prizes. Thank you so much, Sponsors, for your generosity. As soon as I saw these carrots from #BrunchWeek sponsor Cal-Organic Farms I knew I was going to make something healthy. I didn’t feel like making a salad, and I wondered how carrots would be in a smoothie. I did some research and discovered that in order to make a truly smooth smoothie, I would either need a high powered blender (which I don’t have) or I would have to cook the carrots first. I decided to shred the the carrots before cooking them so they would cook faster. I mean, a Carrot Grapefruit Smoothie should be simple, right? Both grapefruit and carrot juice benefits are many. Grapefruit contains many vitamins and are high in fiber. They may help with weight loss, cancer prevention, and diabetes control. Grapefruit juice may cause issues with some medications (I know heart medication is one of them), so check with your doctor if you are unsure. 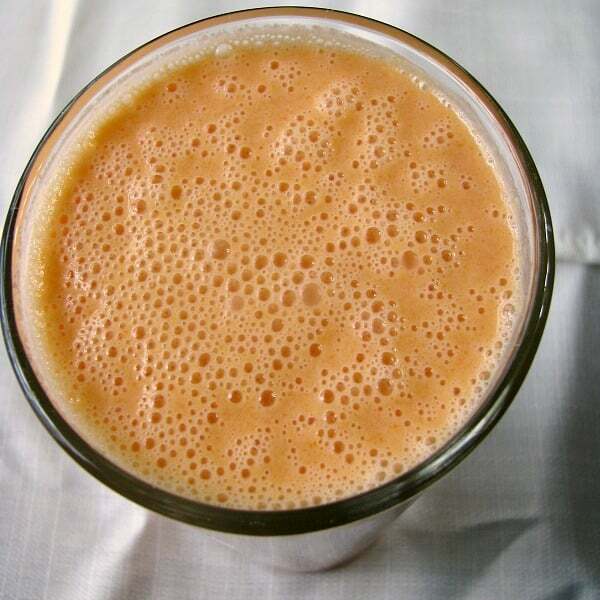 Carrot juice has many of the same benefits as grapefruit juice, plus beta-carotene and high levels of vitamin K. Add the plain yogurt in, and this smoothie is definitely healthy. You do have to really like pulpy grapefruit juice to like this recipe. You can add in more sugar if it is too tart. If you can’t deal with the pulp, substitute the fresh grapefruit with bottled no pulp grapefruit juice. Do you need other beverage recipes perfect for brunch? My favorites are an Easy Strawberry Honey Spinach Smoothie , Bacon Jalapeno Bloody Mary and Watermelon Punch, if you can find in season watermelon. 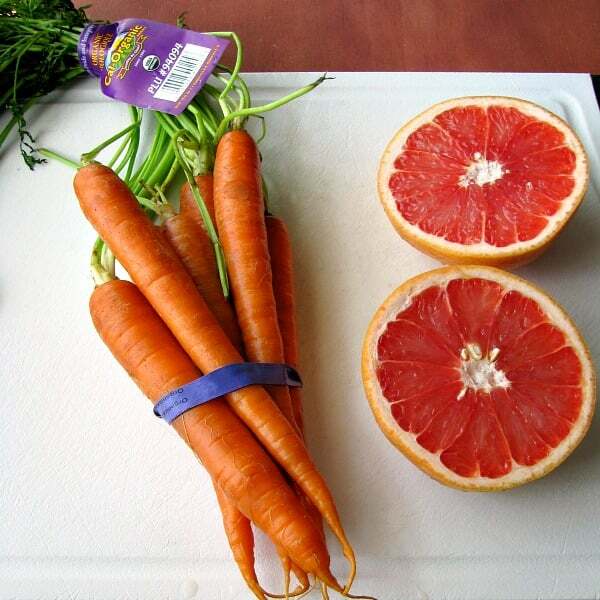 Read on after the Carrot Grapefruit Smoothie recipe to see all the other great #BrunchWeek recipes shared today. 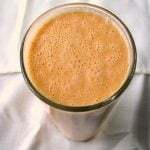 Healthy, tart Carrot Grapefruit Smoothie made with organic cooked carrots, fresh grapefruit, and plain yogurt, is perfect for breakfast, brunch, or a mid-morning pick me up. Place the shredded carrots in a small pot and cover with water. Bring to a boil and keep at a low boil for 5 minutes. Drain and rinse under cold water until cooled. 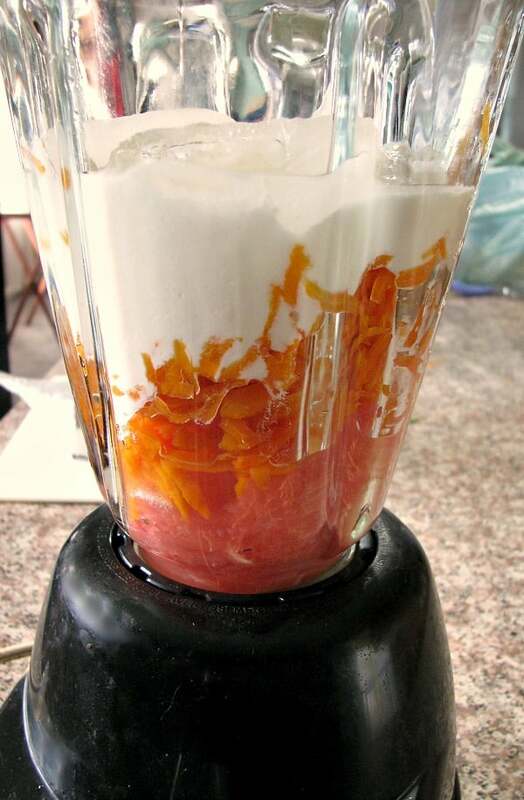 Place the sectioned grapefruit in a blender, followed by the cooked carrots, yogurt, squeezed juice from both grapefruit halves, ice cubes, and sugar. Blend until completely smooth. Serve cold. Pancakes are my favorite brunch and I like to brunch with my bff! Smoothies are one of my favorite go to breakfasts and this flavor profile sounds wonderful.